The key to creating the perfect home office is to make the space motivating without being distracting, and ensuring that it includes everything that you need in order to do your job properly. Here we share some home office decor ideas which we hope will help you to design a fantastic workspace within your house. Whether you work from home or in an office in a building with colleagues there are often important items that are personal or private that you'd like to ensure that no one else can get access to, or stumble across accidentally. People often opt for a desk with lockable drawers where they can file away all of their important documents at the end of the day and then take the key with them when they leave, but you may feel that this isn't very secure if there is the possibility that others could be searching for something in your office. It isn't very often that you find an item of furniture that is both fun and functional, but when you have a secret door bookcase installed in your house you can be sure that it won't only be a practical addition to your home, but will be a talking point with your guests too. A bespoke floating shelving unit is undoubtedly one of the best ways to take advantage of a free wall as you can gain additional storage space and refine the overall look of your room. This shelving installation demonstrates exactly how a well-crafted, expertly installed unit can transform the appearance of a simple living space. 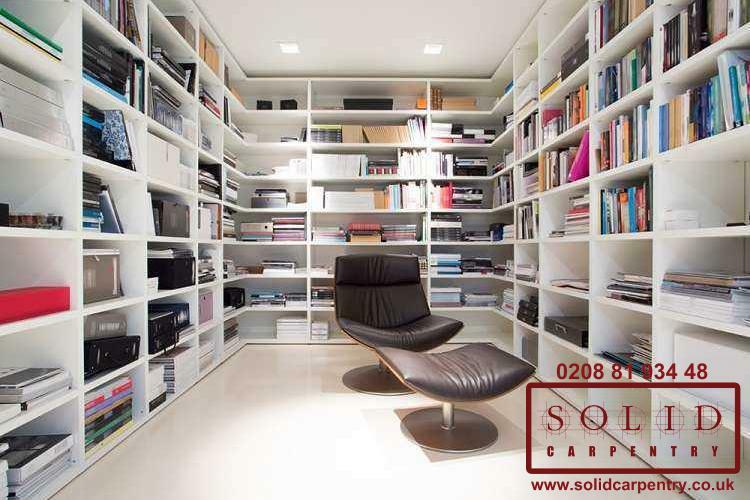 If you wish to enhance overall look and feel of your room, add some special touch and more storage space with the help of bespoke shelving units, Solid Carpentry is able to assist. Solid Carpentry professionals are ready to design and install bespoke floating shelving units in both residential and commercial premises in all London surrounding areas. Do you need built-in wooden wardrobes for your bedroom, bookcases for your library or wooden storage cabinets for your kitchen? We are ready to offer you a comprehensive selection of custom wooden storage solutions featuring premium quality and functionality.